I received the following communication in September 2011, concerning my first novel The Gemini Ring. There are hints in the book that the reality we are presented with may be other than normal, but we are experiencing it through Peters' point of view, and Peters is a rationalist. Is he experiencing premonition and transformation from life to afterlife? Is Octavia some mad Frankensteinian genius, a devotee of the transformative power of creation, ensnaring men in her seductive web? Is she some darkly angelic force of nature who ushers the doomed to their next incarnation? Does being one preclude being the other? In this story, I think, by being the former, she also acts in the role of the latter. Is she truly timeless? When she says that she has known Peters' father and grandfather, does she mean his direct progenitors, or is she referring to his "father" as all men who have come before? By how many names has she been known, and by how many men? I do not obsess over answers, I revel in the Mystery - it is a philosophy I have come to embrace over time. I got to the final page of THE GEMINI RING after a second reading and found my self halted in my tracks, once again. What I take from it is a sense of transformative freedom, all ego destroyed, and existence simplified. Anyhow, as I see it, by the end, Peters has traveled beyond the point of return, but he finds that he cannot continue on in the direction he has been going, so he relies upon Octavia and friends to choose what is best for him. And what is best for Peters, the most compassionate decision, is to release him from it all. He will never be one of them, and he cannot go back to who he once was. At least that is how I feel about it. The ending is beautiful, and that is not changed by whatever horrors may have led up to it, or whatever tragedies may lay behind it . If anything, that is what makes the final passage so powerful for me. Once again, I enjoyed the book immensely as a fun, weird read, and I have never read anything quite like it. So, thanks again for writing it. I look forward reading THE ICE CAVES. 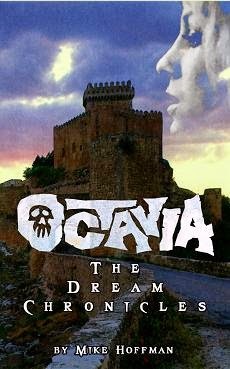 You can grab this very book right now on Amazon, in fact both novels are collected into one volume called Octavia: The Dream Chronicles. NOTE: When you order your copy from Amazon, please email me with your order info, as apparently their system is not reporting all sales, or royalties, to we authors.